Wrenbury & District Model Railway Club are holding their 5th annual Open Doors event on the 29th & 30th of June. The public are invited to visit the Village Hall Cholmondeley Road Wrenbury CW5 8HG between 7pm and 9.30pm on Friday the 29th and 9.30 to 4.30pm on Saturday the 30th. The hall has parking, is wheelchair friendly and refreshments are available during this FREE TO ENTER event. The superb 0 gauge layout ‘CHELAGASA TOWN’ complete with sound chipped locos and exception detailed buildings will make a welcome return. The American H0 layout ‘Wisconsin Rapids’ which represents an industrial district in the U.S.A. will attend. This compact layout shows what really can be achieved in limited space. Examples of Digital Command Control 00 locomotives with sound chips fitted. The club’s first Modular board, just 48 x 20 inches. Ideal for those who don’t have the space for a large layout at home. An additional visiting Garden Railway will be running plus the first phase of the club’s latest project in 0 gauge. 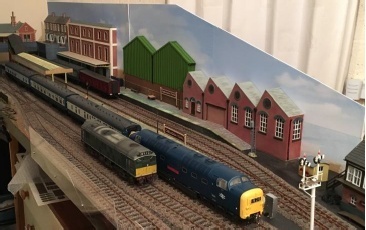 A selection of model railway items and die-cast vehicles are for sale plus an explanation of the various popular modelling gauges. Railway DVDs, books and magazines are available plus the new free magazine ‘A Guide to Modelling’. Examples of wooden display cabinets and transit cases for your model railway locos. Subject to weather – 2 sit-on traction engines will attend on the Saturday. We even have a wooden train set for the smaller children. For those staying a little longer on the Saturday the staff at the Cotton Arms, a short walk from the village hall, are offering a 2 course special lunch for just £7 per head between 12noon & 3pm. Booking is essential on 01270 780377 – please mention the event. Camping is also available here. For those unable to visit this event the club are attending the big Societies Event in Nantwich Market place on the 21st of July between 10am & 2pm, where they will be running their portable N gauge layout and the Modular Demonstration board with sound chipped locomotives. The club web site will give more details as additional attractions are added.